The Boys in Green impress with their 4-1 victory against the Faroe Islands, The Liberty writes. Trapattoni’s men put their weekend mauling by Germany behind them on Tuesday night as they fired four goals past the Faroe Islands in a deserved victory. The Boys in Green were in total control throughout the match and it was nice to see the manager introduce some fresh faces into the starting line-up, with Robbie Brady and Marc Wilson both starting in the fixture. five goals came in the second half. Less than a minute after the restart, Wilson took the ball inside off the left flank and fired home an unexpected wonder strike with his unfavoured right foot, into the top corner. Wilson’s goal sent a surge of energy into the squad and Walter’s added a second soon after with a beautifully cushioned header, just out of reach of the poaching Robbie Keane. The Faroes pulled a goal back when a glancing header on the penalty spot flew beyond the reach of Westwood. 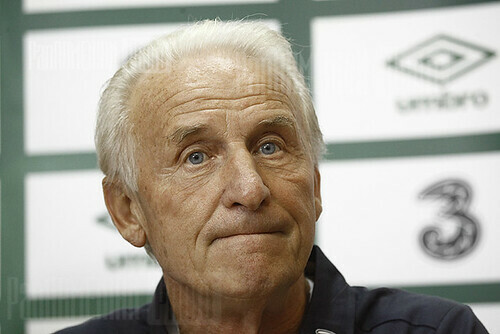 Nervy moments ensued for Trapattoni and the Irish fans. However a brief spell of dominance for the Faroes was swiftly ended when Walter’s cross was put into the back of the Faroe’s net by one of their own defenders. The final nail in the coffin came from an Aiden McGeady corner and Darren O’Dea headed home his first International goal to seal Ireland three points.